It seems like I am on a roll with pasta. As simple as this looks, it is actually very bold in flavors. The acidity of the tomato, the saltiness of the anchovies and the capers and the heat from the chilli flakes... It is the sauce here that offers a real punch to the taste buds. This doesn't have to be served hot from the pan. However if you substitute the spaghetti with a shorter type of pasta, it makes great accompaniment to a salad. 1. Put water for the pasta on to boil. 3. Add salt to the boiling water and cook the spaghetti as per packet instructions. 4. 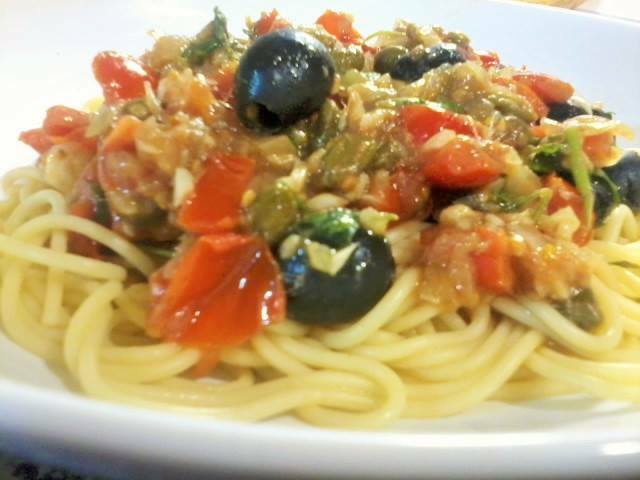 Add the chopped tomatoes, olives and capers and cook for about 10 minutes. Taste for seasoning. 5. Add the cooked spaghetti, stir to mix and scatter with chopped parsley.